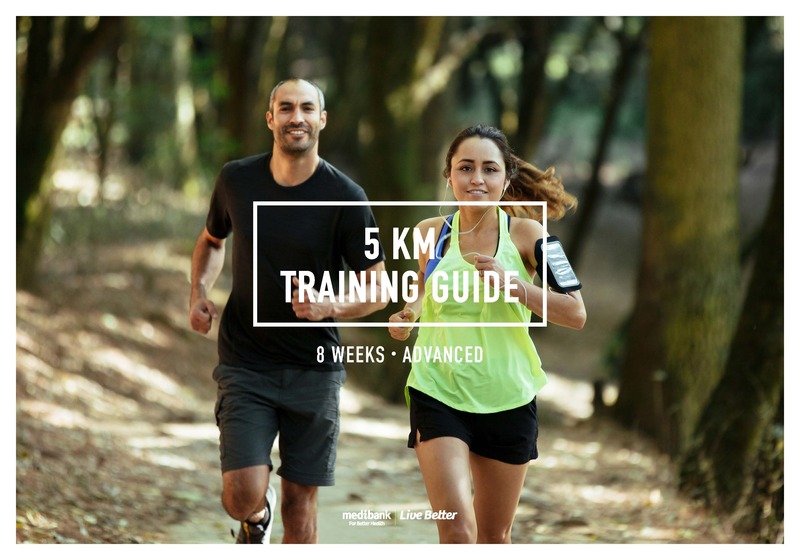 This training guide will get you improving your 5 km time in 8 weeks. If you’re feeling pretty good running 5 km and now you want to take it to the next level, this is the training guide for you. Over 8 weeks, you’ll build up your speed, strength and endurance to reach your personal best. Run: This refers to running at a pace that you are comfortable with. The key is that you cover the distance. Fast run: There is no specific definition for this speed – it just needs to be faster than the comfortable pace you regularly run at. Get into the habit of timing your regular runs and your fast runs to ensure you are stepping up the speed a little. Long run: There is no specific definition for this speed – it just needs to be faster than the comfortable pace you regularly run at. Get into the habit of timing your regular runs and your fast runs to ensure you are stepping up the speed a little. If you start to feel fatigued, take a drink break or slow down to a walk. Interval training: This is how you improve your speed. Interval training involves bursts of running at an increased pace, followed by a recovery period running at a slower pace. For example, run 400 m hard and fast, and recover by jogging or walking 400 m, then repeat. Before interval training it’s important to warm up by jogging a kilometre or two, stretching, and doing a few sprints of 100 m. Cool down afterwards with a short jog. Tempo run: This training technique involves continuous runs with an easy beginning, a build up in the middle, then ease back and cruise to the finish. A typical tempo run begins with 5-10 minutes easy running, continues with 10-15 minutes faster running, and finishes with 5-10 minutes cooling down. Rest: Rest and recovery is an essential part of your training. This training guide includes up to two rest days a week. The final week before the 5 km race also includes more rest. Taper your training so you can be ready for a peak performance on race day. Stretch + strengthen: Stretching is key to a strong, supple body and should be done daily. Strength training, particularly for your core muscles, is an important focus of this training guide. Try bodyweight exercises like push-ups, chin-ups or dips, or light weights with high reps at your local gym. Mondays and Wednesdays would be good days to undertake strength training (optional).